When I first started working in an Agile environment I was excited to have finally reached the land of opportunity. I was well aware of the problems with Waterfall. The big-upfront design phases. The painful stakeholder reviews. Having to endlessly review and revise wireframes. Countless annotations explaining every microscopic detail. Pesky developers not building things as specified. I thought all these problems would magically disappear with Agile. All of a sudden developers would become my best friends. My wireframes wouldn’t need to be anywhere near as detailed. Document version numbers would stop getting in to double figures. My designs might get launched in the same year I created them. However, I soon realised that these things didn’t just happen automatically. Agile opens up an exciting new way of working for designers, but it also presents a new set of challenges. To experience the benefits I had to adjust the way I worked. These are some of the challenges I’ve faced and adjustments I’ve learnt to make to my UX practice along the way. In the Agile software development world dedicated design time becomes a precious commodity. 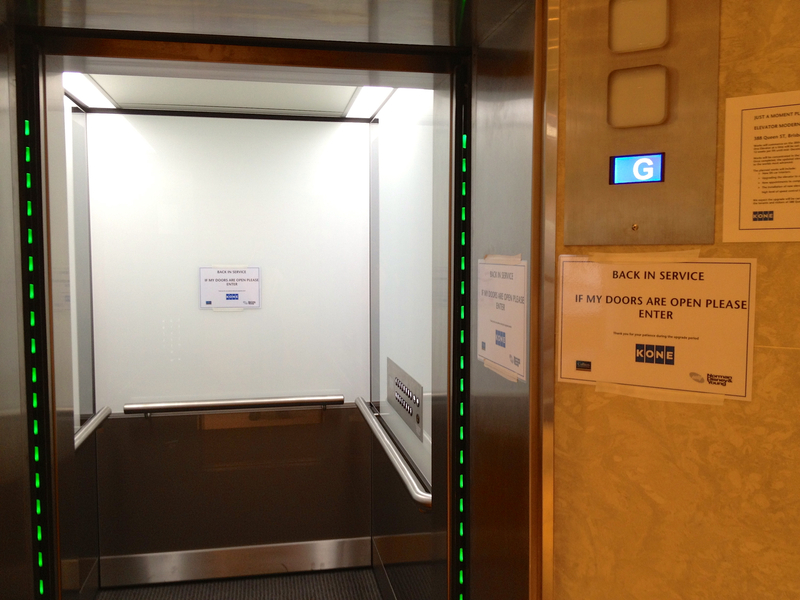 The traditional user-centered design approaches start to encounter problems. Taking the time to conduct in-depth user research, analyse the findings, write them up, and then design an extensive solution is an expensive luxury that is rarely affordable. 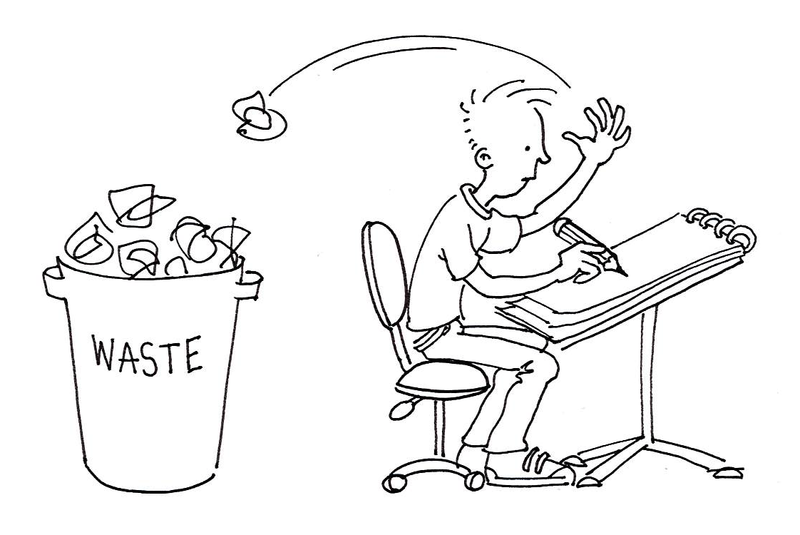 Challenge #2: Feeling like time spent exploring ideas is a waste when you’re trying to be Lean. The traditional creative process involves playing with designs and seeing where they lead. More often than not the designs themselves get discarded, but the learnings from them fold back in to the overall solution. Once you start to embrace a Lean way of thinking, taking the time to play around with different options, then discarding them can feel like your deliberately wasting time. This test and learn approach is actually a core part of Agile, but we just have to adjust to do it in a different way. 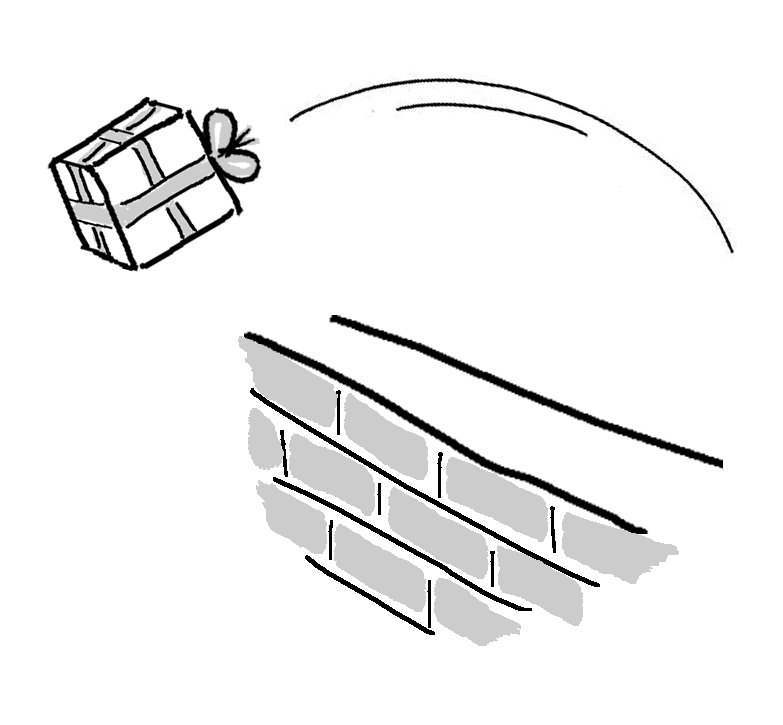 Challenge #3: Getting out of the deliverable business. Our traditional approach of producing shiny, all-encompassing deliverables doesn’t work in an Agile process. Not only do you not have the time but the documents are usually out-of-date before you finish them. On the flip side, it’s not just a matter of producing lots of low-fidelity prototypes and then handing them over to developers. There can still be communication breakdowns. 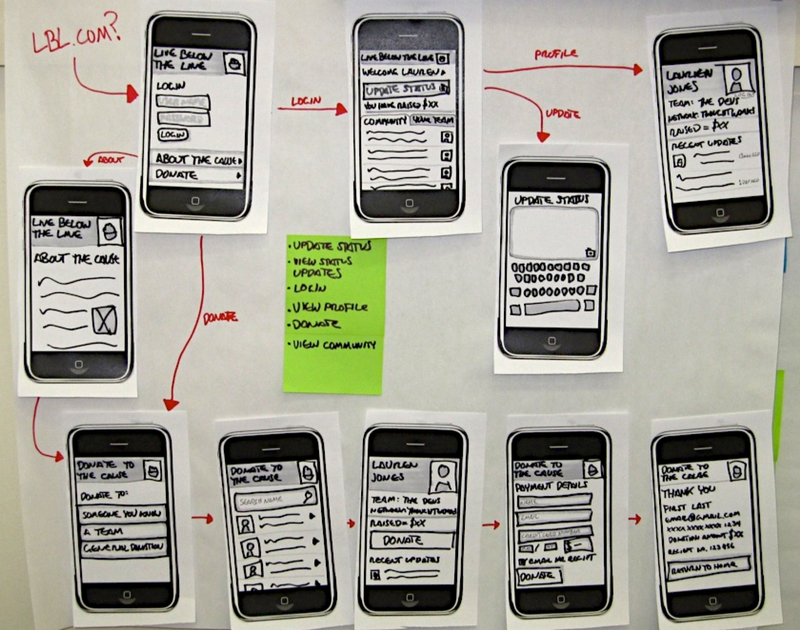 We need to use prototypes as a communication tool, not just a deliverable. We need to get out of the deliverables business. All of these challenges can be overcome. We just need to adjust our practices to get the most out of the Agile process. We need to focus on the value we deliver, not just the outputs. Once we do, we’ll find that it actually improves our ability to create awesome experiences. These are some of the ways I’ve learnt to adjust my practice to be a better designer. Adjustment #1: UX as a facilitator, not just a designer. Change the way you see your role in the team. We need to let go of control of every little detail and empower our team. We need to use our research skills to take the team on a journey of understanding and empathising with the user. We need to become an Information Radiator. Not the sole source of knowledge. Give everyone the knowledge required to build a great product that meets the needs of the target audience. There will still be plenty of design work required by you as a designer, but you will be able to start sharing the load. Adjustment #2: Design as a continuous activity. Make design an ongoing activity, not just a phase. Agile UX isn’t just about breaking our activities into small chunks, i.e. mini-waterfall. It’s about changing our approach and how we work. Other fields are embracing the “Continuous” approach. Product management is embracing the Lean Startup movement. Launching a MVP, testing and proving a proposition, then continuing to evolve it. The development community is doing Continuous Delivery to make this possible. The ability to release software regularly (i.e. 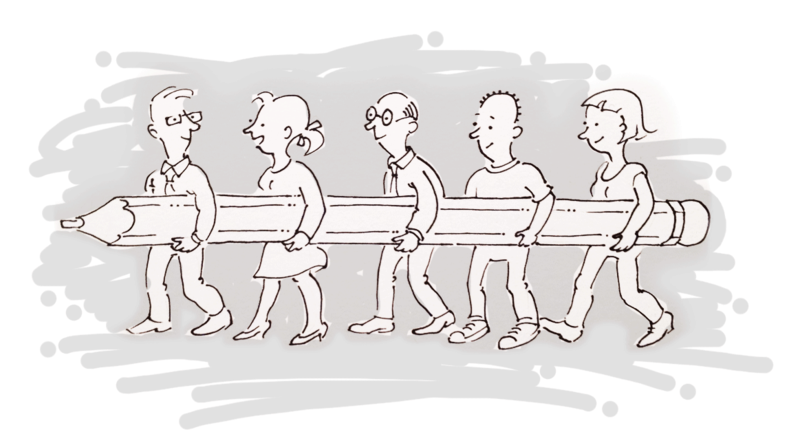 daily rather than a few big releases a year) is allowing teams to reduce feedback cycles. Testing and learning rapidly. As designers we need to embrace this mindset. We need to change our approach to embrace the benefits of this. Shortening our feedback cycles. Learning quickly. Finding out what experiences work and building on them. Adjustment #3: Do just-enough, just-in-time. Just-in-time design does what it says in the tin. Don’t try to do everything upfront. Start by sketching a vision, then figure out the details as you go. Make decisions at the last responsible moment. Change is relentless. If you do too much upfront, the requirements will probably change by the time you get your designs out there. These are some of the tools and techniques I’ve been using to make these adjustments to my practice. 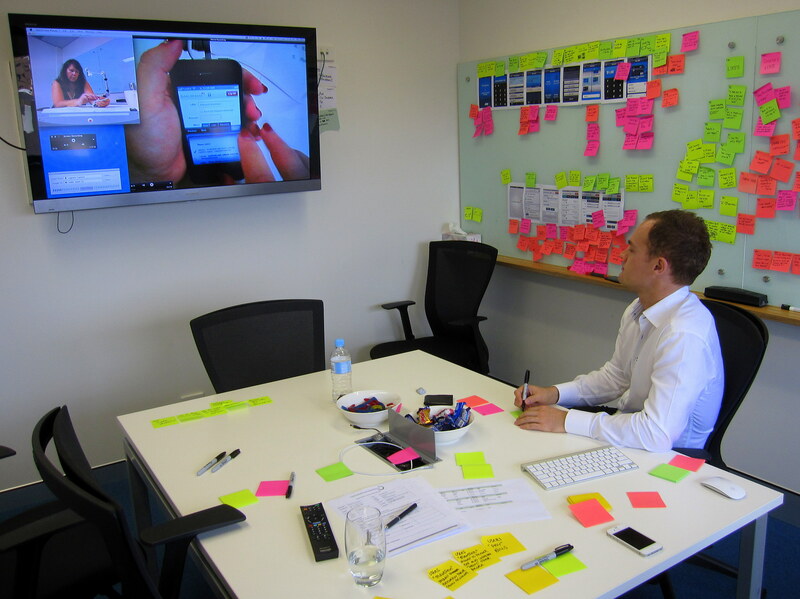 To start projects, run collaborative design workshops with stakeholders and the Delivery team. These involve getting everyone in a room and sketching out their ideas about what the product should/could be. Put it all up on a wall where anyone can see and contribute to it. This creates a sketchboard – a lightweight shared vision of the product, which everyone is bought in to as they contributed to it. This shared vision can inform the story writing process when kicking off projects. 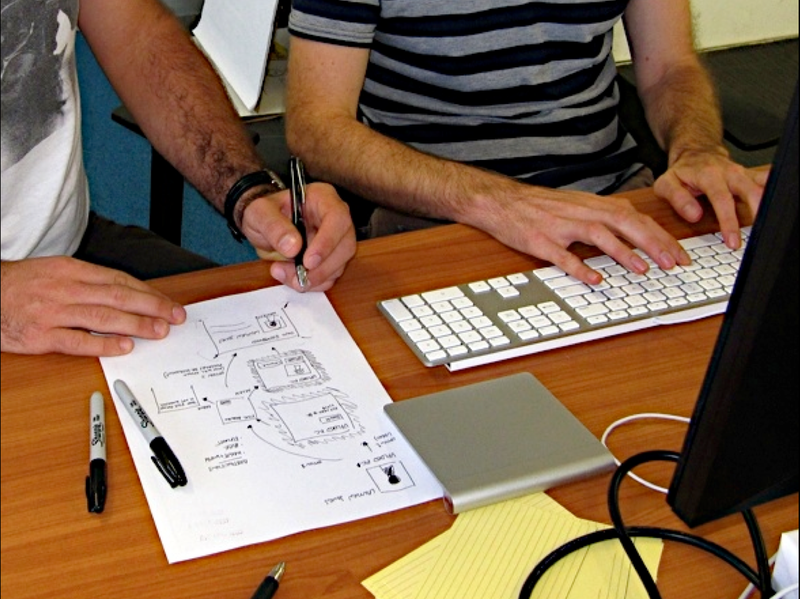 The sketches can also quickly be turned in to prototypes to test and validate the team’s ideas. The iteration cycle allows us to shorten our feedback loops. Each iteration allows us to design and build something new, quickly turning design ideas into working code. These functioning ideas when can then be tested, validated and improved. We no longer have to wait months/years to see if our design works, we can do it immediately. Problems throwing things over the wall? There shouldn’t be one in the first place. Co-locate yourself with and become part of the development team. Multidisciplinary teams all working in the same place sharing ideas is a key principle of Agile. You don’t need to waste time typing up emails when you can have a quick conversation. This also allows us to open up the kimono. Lots of developers have never worked with a UXer before. They want to learn to work with us as well. Co-location naturally allows for this to happen. As the details start to emerge turn your Sketchboard in to a Design Wall. Fill in the details of your vision as you go. Claim space alongside the Project team’s card wall. Put our wireframes/visual designs on the wall. This will ‘radiate’ details of the UX design and become a source of truth. Do just enough, just in time. Don’t aim to capture every detail upfront. Capture just enough, and then have a conversation. Sometimes a paper sketch is enough, others a hi-fi mock is required. It’s the conversation that is important. The closer you can get to designing in code the better. 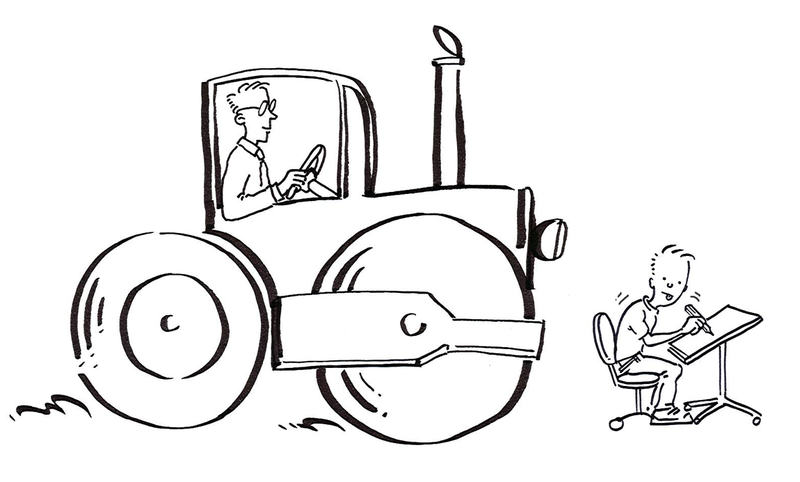 Bring user feedback in to the team as often as you can. Go guerrilla. Run three sessions every Friday, or every iteration. Make it easy for the team to watch. Capture you findings on Post-it notes, not in PowerPoint. Often you can put the findings in to action straight away if the team is still working on the feature. If you can’t act on usability fixes straight away, become part of the Agile process and prioritise usability fixes like everything else. Write up stories for them and add them to the backlog. The Product Owner can make an informed decision about whether to prioritise them, or build something new. This helps avoid the tension of us designers trying to squeeze small fixes in to the workload in an unstructured way. Some of these Agile ideas aren’t too dissimilar to existing UX techniques, often they just have a different name to what we usually call them. Some principles can be easily applied to the design process, with just a bit of willingness to learn and adapt. As designers, Agile provides us some great lessons and opportunities to work in better ways. At the same time we can add value to the process as well. Our ability to visually communicate ideas and share a vision helps drive the process and provide a customer focus which can often be lost in the mix of delivery activities. They key goal is have an entire team collaborating together, finding ways to combine their skills and talents together to create great experiences. 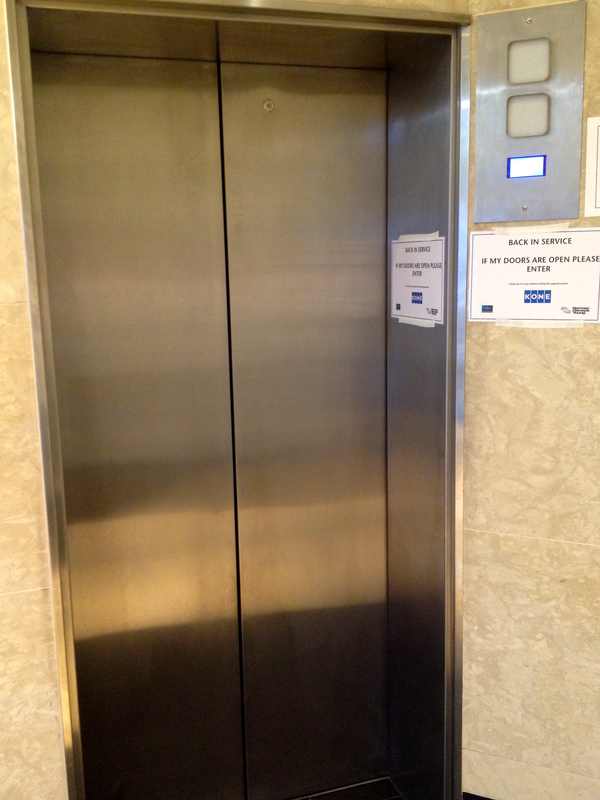 This post is based on this presentation Agile UX conference presentation. 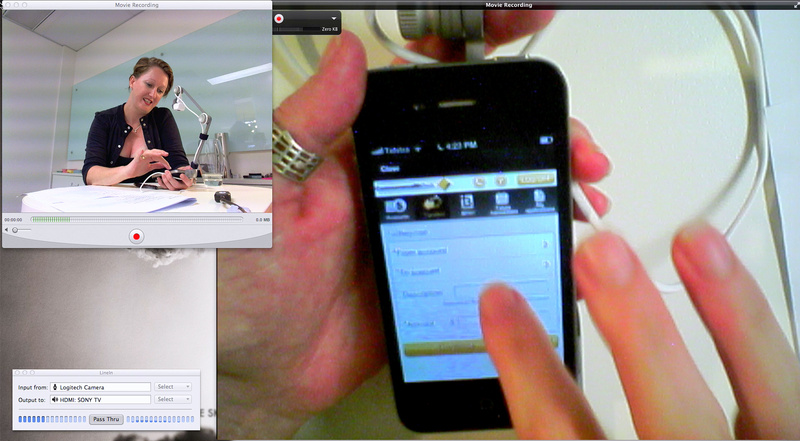 One of the challenges of running usability testing on mobile devices is how to record a video of the session. On desktops recording sessions is easy. Applications like Morae or Silverback have been allowing us to do screen captures with a picture-in-picture window of a participant’s face for years now. They simply use the mouse pointer and webcams to capture of full picture of what the user is doing. On mobile devices it is not so easy. On mobile devices it’s just as important to see what the users hand/fingers are doing as the targets they are tap on. When you combine this with the movement of handheld devices recording a usability testing session becomes somewhat more complicated. What would we change next time? 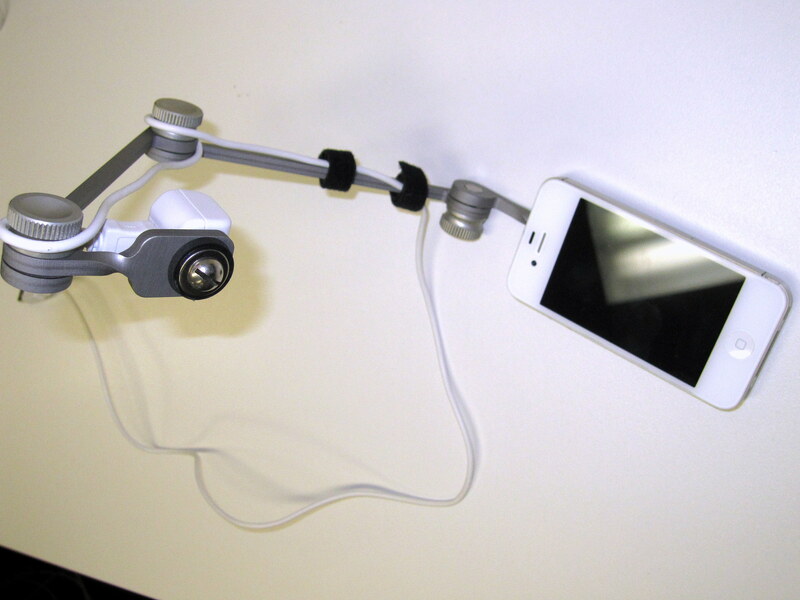 Attach a camera to the device itself. Mount a camera above the space where the device will be used. Record a screen capture of the device. Stable view of the screen. You can see the participant’s hands and finger movements. Device agnostic. Device can be quickly and easily swapped as they don’t require anything to be locally installed. The user has to overcome the weird feeling of an unusual camera mount attached the device. Screen usually has slight perspective tilt due to the camera angle. Camera recording resolution has to be balanced against physical weight of the camera mounted on the device. Device can be quickly and easily swapped. 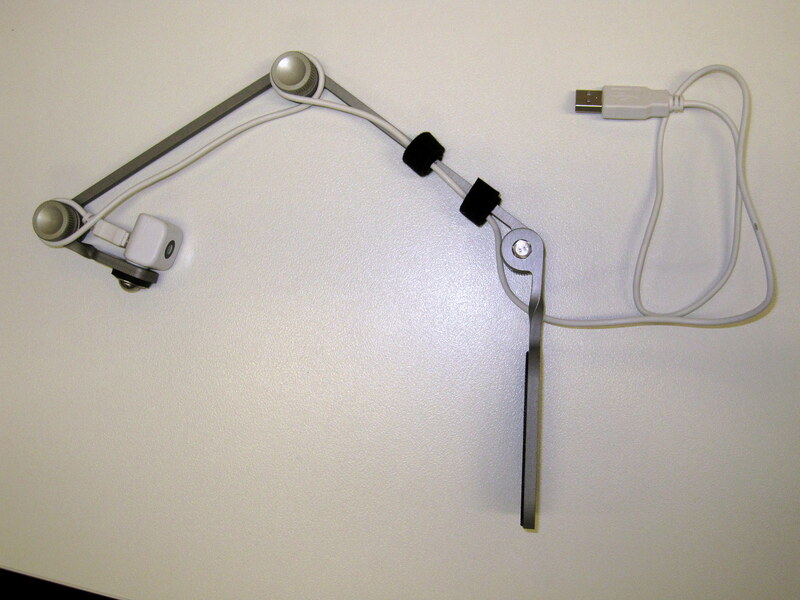 The user can freely pick up and hold the device in a natural way. Unstable view of the screen depending on how much the user moves the device around in their hand. User has to keep the device within a certain area bounded by the camera view. Little limitation on how the user needs to hold the device. No visibility of the participant’s hands and finger movements. Requires screen capture software to be run on the device, which is currently inconsistent between platforms. Screen capture software can overload some devices. Personally I prefer the first option of attaching a camera to the device itself. In most situations having a clear view of the screen and the hands outweighs the participant’s feeling a little bit weird about the camera hanging over the device. 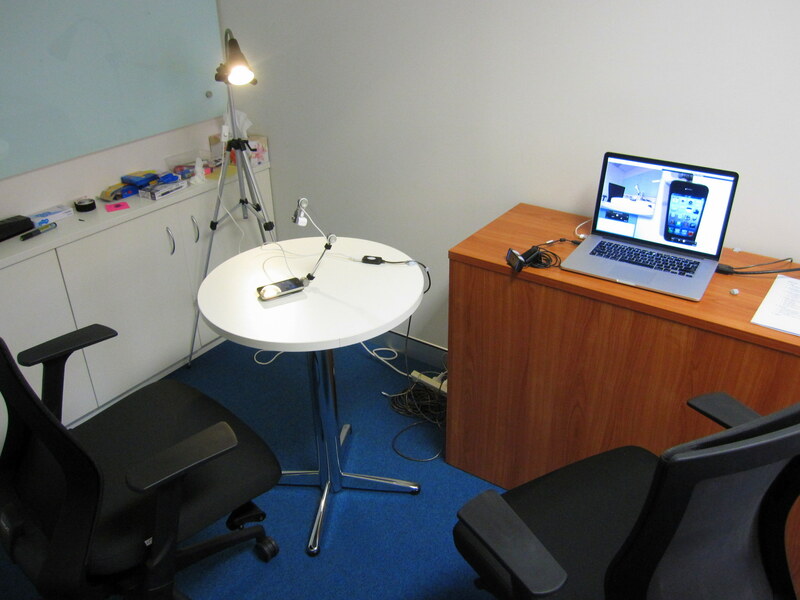 Having chosen to go with the option of mounting a camera on the device, we set about turning two meeting rooms in to a full-featured mobile device usability testing lab. 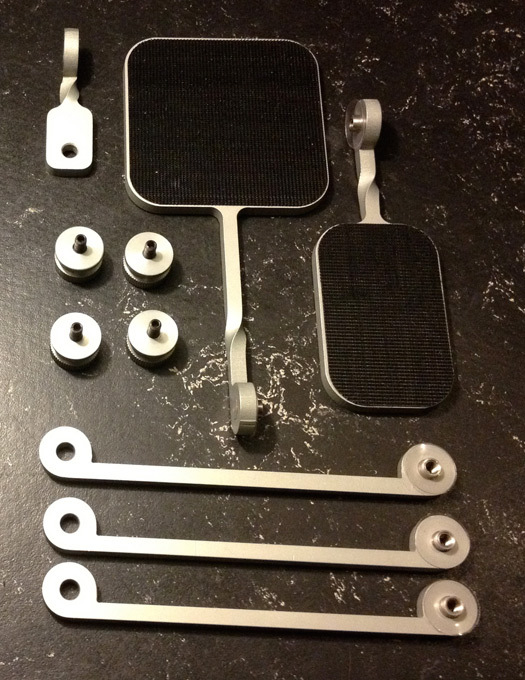 Here are some pictures of what we put together. The testing lab room setup and ready to go. A session in progress, with the participant using the phone and moderator guiding the session. 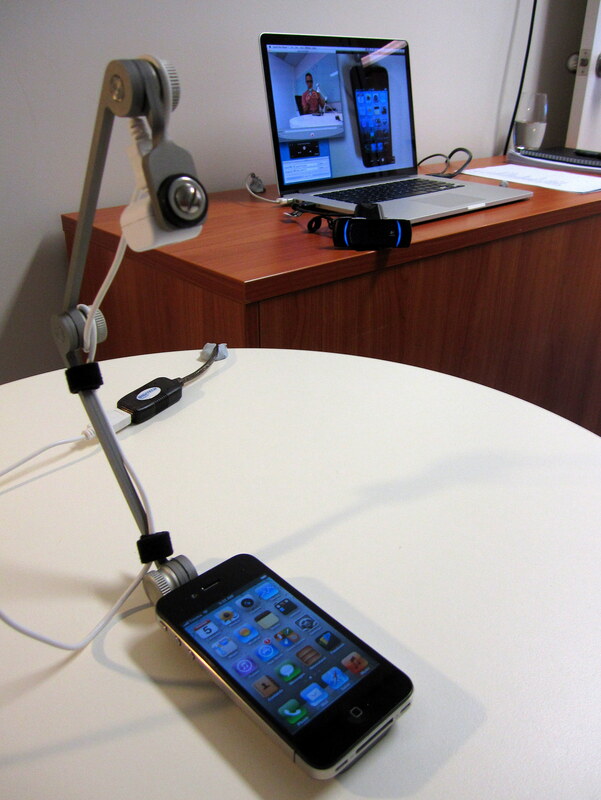 The participant’s view of the device and recording equipment. The testing lab and observation room side-by-side. A note taker observing the video feed from the next room, taking notes on post-its. The video output, the device view with a ‘picture-in-picture’ view of the participant holding the device. What’s happening in the room? Two cameras; one mounted on the device, the other in front of the user capturing their face and them holding the device. Both cameras feeding in to a laptop, which was recording the session. We used a MacBook pro for this setup. This machine comfortably dealt the processing load for this setup. It also had the 2 x USB inputs and 1 x HDMI output that we needed to connect to the cameras and TV. Laptop sitting to the side where the facilitator could see it. This meant that the facilitator could sit back and watch what the user was doing through the screen rather than having to always be looking over the participant’s shoulder. HDMI output cable running to a large TV in the room next door broadcasting the screen share and audio to observers. The centerpiece of the setup was our camera mount – Mr Tappy. 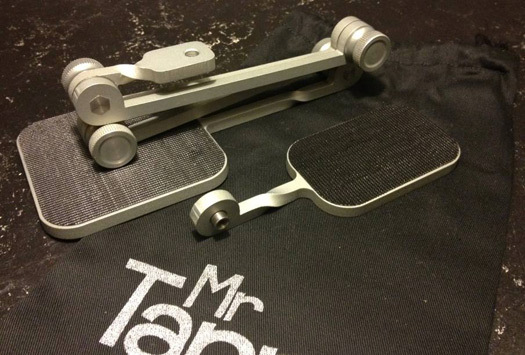 Mr Tappy is a simple mount, which you can attach a mobile device to, with an adjustable arm that extends over the top of the device to attached a camera to. The best part about Mr Tappy is that he can be used for all types of devices; phone, tablet, iOS, Android, Windows. 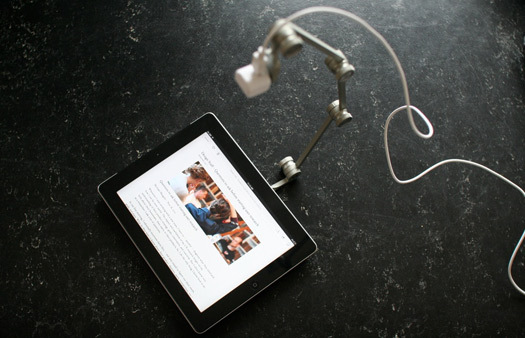 The mount is flexible enough to accommodate any sized device. The only restriction is needing to attach some velcro to the back of the device for Mr Tappy to secure to. Mr Tappy is the brainchild of Nick Bowmast, who I can happily say I used work with a few jobs ago. He took the idea that came from an old improvised mobile testing sled made out of perspex and turned it in to a high-quality product designed specifically for this purpose. I highly recommend it. One thing we learned was that it’s important to pick up and hand the device to the participant so that they start with it in their hand. 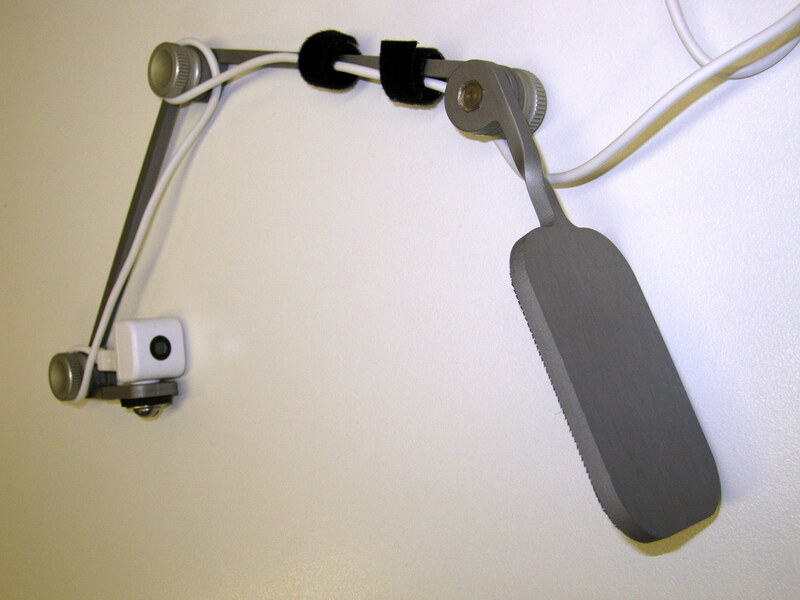 The attached camera mount does make participants reluctant to handle the device. Handing it to them when you first ask them to start doing something on it helps get it in their hand and using it. Still, a few participants just put it back down on the table and used it there. In our context it wasn’t too much of an issue as using a phone whilst it sits on a tabletop is not an uncommon behavior anyway. Otherwise, it’s important to be aware of it that impacts what you are trying to test. For the camera mounted on the device we used the iCubie camera that Mr Tappy recommends. It’s the smallest and lightest camera that could be found at the time. It’s downside is that it’s not super high-resolution. Therein lies the trade-off. We considered using a higher quality camera but they all just became too big and bulky to use on the mount. Instead we decided to concede the quality for being less obtrusive. 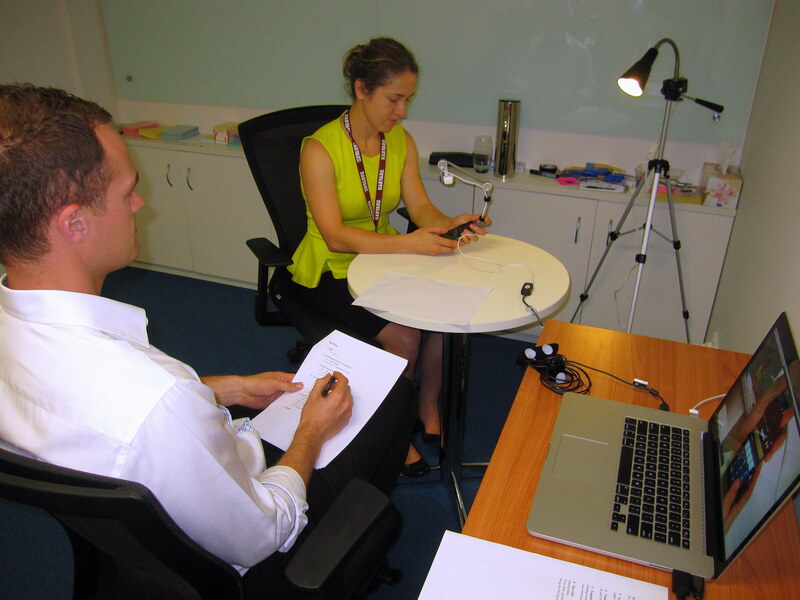 For the other camera we had on the table camera focused on the participant we used a Logitech HD Pro Webcam C910. It was less important which specific camera we used for this. We used the Logitech as we had one on hand and knew it did good quality HD video and audio. The recording software was where we had to improvise the most. All the applications out there at the moment were either too expensive to bother with, didn’t allow us to capture the output from two different webcams at one time, or required too much post-production work to sync video feeds. In the end we took an ad-hoc approach of simply having the two camera feeds open on the desktop using separate applications, then using a third application to do a screen capture of the whole desktop. Whilst not the prettiest video outputs you’ll ever see, it captured everything we needed it to. We had to ensure we left enough hard drive on the laptop to record 50-100gb of video. Full resolution videos of an hour session typically ended up at 30gb before we optimised them to a lower level. We kept an external hard drive handy to off-load videos. We also had two laptops that setup so that we could quickly swap them if necessary. Occasionally this was necessary if a video was taking a while to be processed and saved. The setup of the office, with two rooms next to each other and a big TV in one, worked out really nicely for our setup. An alternative option that we were also considering was to broadcast the session to a separate location using Skype (or similar) to screen share the video and audio to another location. Reflection/glare from the ceiling lights can be an issue in seeing the screen of the device through the camera mounted on Mr Tappy. To avoid this we turned off the lights directly above user (we unscrewed the fluorescent lights). This creates a problem where the camera can’t deal with the contrast between the screen brightness and the dull background. To compensate for the lack of light we setup a lamp to the side of the user, which lit up their hands. We also turned down the device screen brightness to balance out the difference. The balance between all this needs to be tweaked depending on the exact room. The unintended side effect of all this was to create a somewhat ‘intimate’ setting in the room for participants to walk in to. We made sure we called it out and explained why so that participants weren’t too put off by it. Given that the two rooms were directly next-door we connected a Bluetooth keyboard and mouse to laptop, which we put in the observation room. This allowed the observers to run the laptop and control the video (i.e. starting/stopping and trouble shooting), which helped reduce the load on the moderator in the room. Overall we were very happy with the whole setup. I’d happily take the same approach and recommend it to others – hence why I just put this summary together. Mr Tappy worked well as the camera mount and solved the problem of a camera mount. I’d still keep looking for a higher resolution camera than the iCubie though. I’d also keep my eye out for a better media player solution. In fact, as I was putting this post together someone recommended SecuritySpy to me. Despite being made for a different purpose, looks like it would do the trick for a small license fee. Otherwise, here are some of the approaches I’ve found that other people have used. I just had the surprising pleasure of having to stop in to the Post Office over lunch to send a parcel. 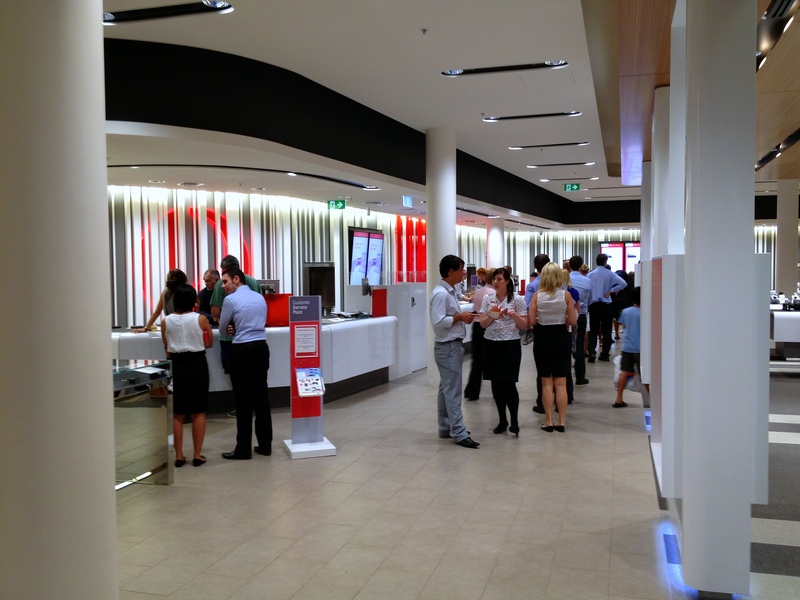 This is not an errand I would normally describe a pleasure but this is the first time I’ve seen the Brisbane GPO since their store layout redesign. 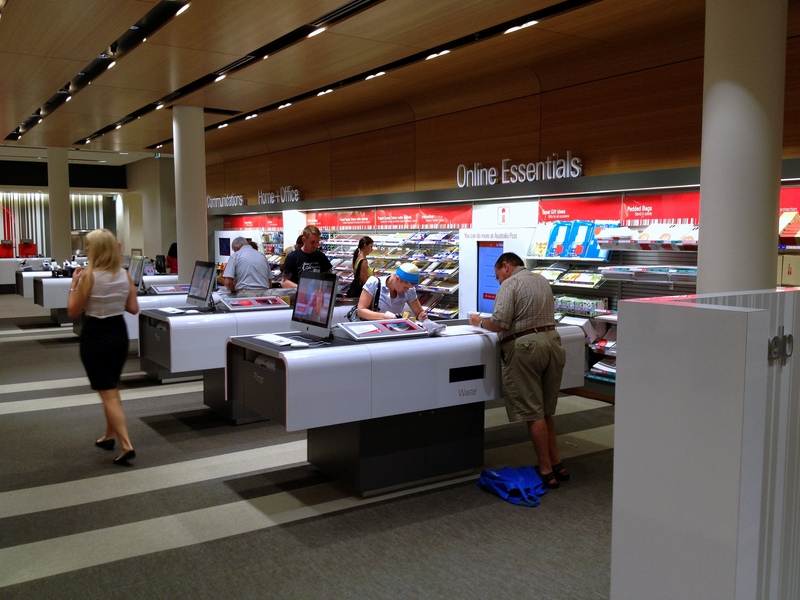 The product shelving layout, self-serve kiosks (using the same hardware as supermarkets), easy to follow interactive instructions and well labelled drop-boxes saw me happily serve myself without the need for assistance from any of the floating staff. And all without having to wait in a queue for 20mins. I’m now looking forward to the next time I have to go old school and use the snail mail. 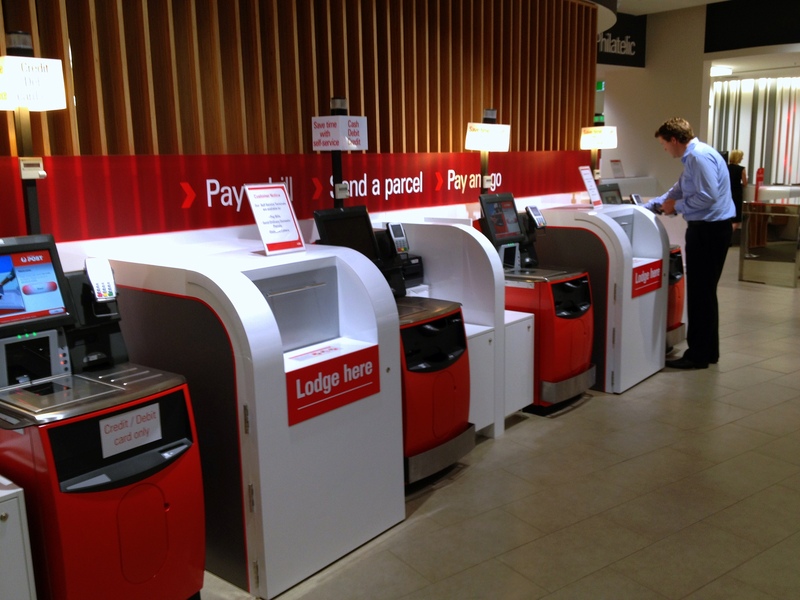 Kudos to Post Office design team for a job well done. I recently had the unpleasant experience of watching a badly presented design concept. It was unpleasant because of my negative knee-jerk reaction to it. Before I control my mouth I started nit-picking minor details, like the choice of font and styles, when all they were after was feedback on the name and the concept. At the time I was rationally aware that I wasn’t being helpful, yet I couldn’t stop. The concept itself wasn’t bad; in fact I really liked it. It was just the pitch itself that was badly done. It was really challenging experience for me because I’m usually on the other side, presenting the concept. I know how frustrating it is to put a lot of work in to a design; considering the proposition and the target audience, how it is represented in the content and structure of a page, and then how the colours and fonts provide just the icing and cherry on top of a well thought out package. I know what it is like to do all this work and then have someone fixate on just the superficial skin of the concept – it’s really annoying. And yet here I was doing it myself. The experience got me thinking about what happened. I didn’t want that irrational reaction to be the only feedback they got from me. Thankfully it was an internal piece of work, with colleagues I know well. This gave me the opportunity to mull it over for an hour before getting back in touch and telling them that I actually really liked their concept and that they just had to work on their pitch. The happy ending to the story is that they did a presentation version 2 the next day and they blew everyone away. Rather than walking out feeling negative, the audience were all really excited by the concept and went away feeling pumped. They didn’t explain what the design that they were showing us was for and the context of how it would be used. They assumed we knew what they were doing and why. They jumped straight in to the solution without explaining the journey of how they came to that particular solution. In the interests of time they just cut to the chase and presented the final idea. They presented a draft concept in a high-fidelity polished format, even though it was still a work in progress. They booked a longer time and took us through a more detailed presentation. They provided all the background, context, and alternatives ideas they considered before getting to the solution. Even though the audience already knew bits and pieces of this story it made sure all the gaps were filled in. They hand drew their concept and presented that instead. If you want someone to focus on the underlying concept (not the fonts and colours) present ideas in the same level of fidelity as the idea – rough drafts. You can’t comment on fonts and colours if they aren’t any there. We do a lot of lo-fi prototyping for exactly this reason. State the design problem presented. Discuss the values, attitude, and approach you brought to the design problem. Describe your design process and the major discoveries and ideas you encountered along the way. State the parti, or the unifying concept, that emerged from your process. Illustrated this with a simple diagram. Present your drawings (plans, sections, elevations, and vignettes) and models, always describing them in relationship to the parti. Perform a modest and confident self-critique. Never begin a presentation by saying, “Well, you go in the front door here” unless your goal is to put your audience to sleep. A frustration point for me recently has been companies that list the user experience as their most important priority, yet don’t ever do anything about it. It’s great that people are starting to recognise the importance of the Experience Economy and that a top notch user experience is a must have for company who sees itself as a serious contender in a market. As a consultant I tend to get around a few different companies and in the last year or two I’ve ended up doing quite a few project kick-offs in different places. Pretty much without fail, every company has listed creating a great user experience as top priority. When we run through our project Trade-Off sliders User Experience is usually listed as the least negotiable factor in a project. Yet, more often than not these companies aren’t willing to put in the effort or resources required to build a great user experience. They don’t do regular user research and have limited direct contact with their customers/users, don’t have any internal design capabilities, and don’t ever actually do anything other than saying “yes, it’s our top priority!” or “It has to have a great user experience“. Despite all their verbiage, they are really no more than a Level 2 on the UX Maturity scale: They recognise UX is important but it receives little funding. I regularly get people walking past our sketchboards and design walls commenting on how exciting the UX driven approach is. They get excited by our UX tools and the vision they create. Then they walk off in wonderment thinking about how great it would be for their team to work like that – and do nothing about it. Taking a user centered approach to building a product doesn’t just happen by accident. It takes effort and expertise to do these things – but any team can if they have the right mix of skills. Stop outsourcing the user experience design of your product – your most important asset – to external design agencies. 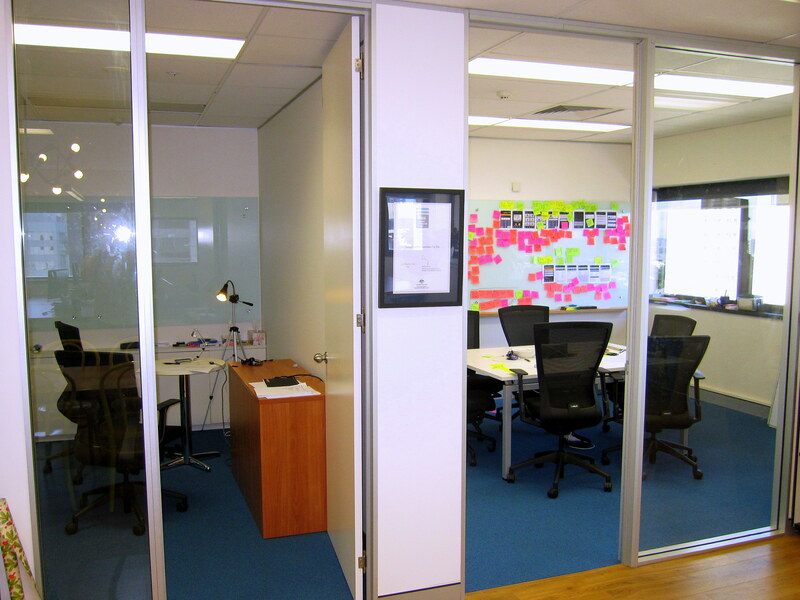 Bring design capabilities in to your organisation. Hire a UX Designer, someone who specialises in creating awesome experiences. They will help you get outside of the building and talk to someone who doesn’t have an employee number. They will help you drive projects with a focus on what the user experience will be, not just what 100 page requirements document says. They will help you build a more mature UX practice. If you make excuses such as “We don’t have the resources” or “We can’t increase our head count” then you’re simply not prioritising your user experience over other things so stop claiming that you do. One of the most useful terms I’ve learnt since working side by side with Devs is Yak Shaving. Today has been a day focussed on becoming fully integrated with the Borg that I’m currently working at so that I can access all the internal systems/tools. At the end of the day I have far more hairless yaks to show than tasks completed.